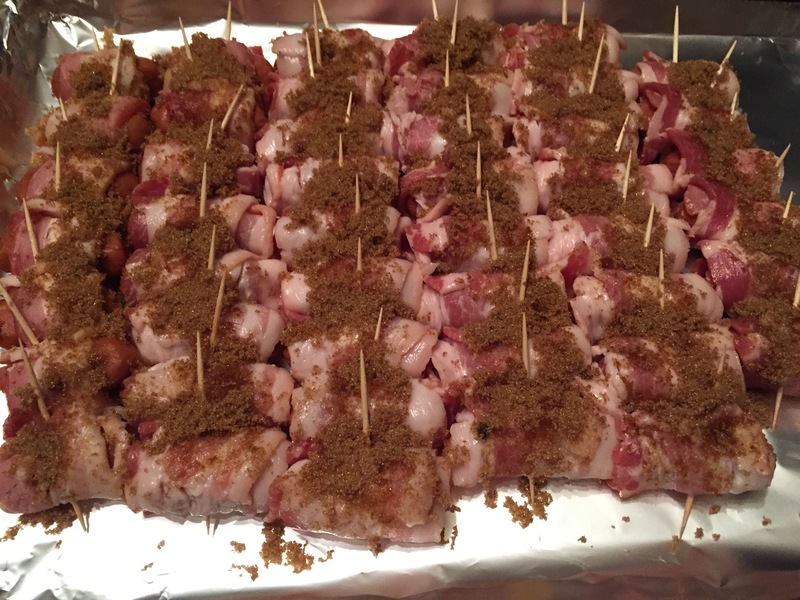 I wanted this recipe to have a fun name so I call them Kevin Bacons. 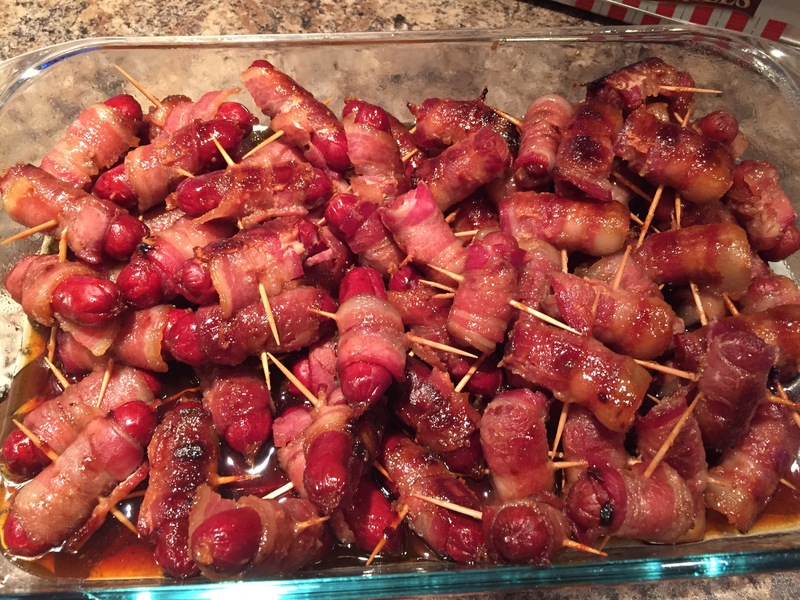 What they are is a mini smokie (or mini pepperoni) wrapped in bacon, baked with brown sugar and then finished in a maple and brown sugar glaze. I promise you these are a crowd pleaser. I made them at Christmas for a pre dinner appetizer and a double batch was almost all gone before the turkey was served. – Line a baking sheet with either parchment paper or aluminum foil. – Cut bacon into thirds. I cut mine straight in the pack as this helps it all hold together and not slide around while trying to cut it. – Open pack of mini smokies or pepperoni. – Once they are all wrapped take about 1/3 cup of the brown sugar and sprinkle it on top of them then lightly pat it down. – Put tray into oven and turn on to 350F. 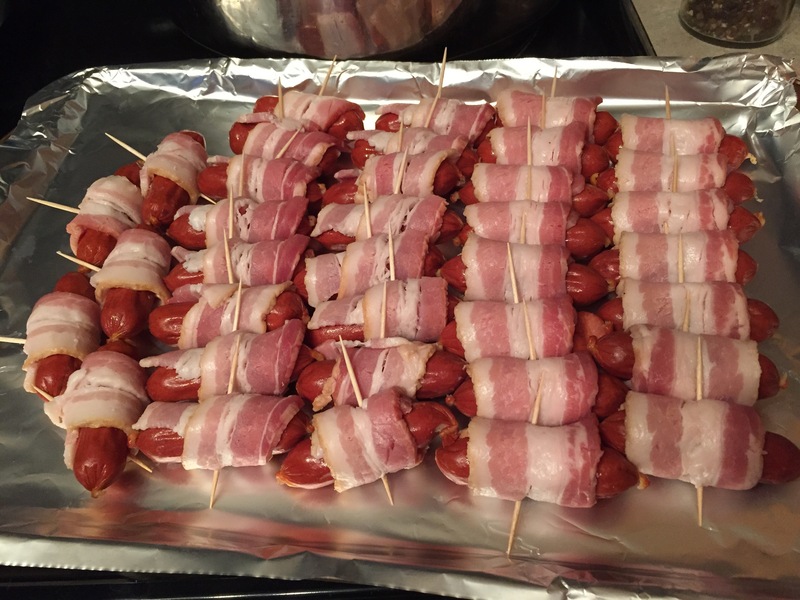 These will take about 20-30 mins to cook (until the bacon gets crisp). Keep an eye on them as once they are done it won’t take long for the sugar to start to burn. – Remove from oven when done and using a slotted spoon or slotted spatula transfer them into either a crock pot (if taking to a potluck) or a baking dish. – In a bowl combine the remaining sugar (2/3 C), the maple syrup and your mustard or hot sauce and whisk together then pour over your smokies. – If they are in a baking dish then pop them back in the oven for about 5-10 mins just to warm them back up. If you’ve put them in a crock pot then keep them on the lowest setting until they disappear, which shouldn’t take long. On our way back from Banff a couple weeks ago we stopped in Calgary to have some lunch with our good friends Mike and Amber (shoutout!). They took us to Farm on 17 Ave (from what I gather this is Calgary’s equivalent of Whyte Ave). Their idea is food inspired by our beautiful province. Since we were there on Sunday we got their brunch menu. The brunch menu is fairly small, consisting of only 7 items and a special. I like when places keep their menu small; keep it small and do it right. I ordered the special which was a porchetta benedict which had an olive tapenade spread on the halved English muffin, smoky porchetta, 2 poached eggs and a grainy mustard hollandaise sauce served with a fresh salad on the side (I don’t recall how much this was but I think it was around the $15 mark). The eggs were beautifully poached! Runny yolks mixed with the tangy creamy hollandaise sauce which was easily mopped up with the yummy English muffin which I would bet money on that it was also fresh. The olive tapenade sounds like a strange component for a benedict but it went wonderfully with the smoky pancetta. This dish was delicious and I scrapped my plate clean! Ward ordered the French toast which was what they call a ‘french toast casserole’ topped with maple syrup and cinnamon whip and had seasonal compote on the side and 4 slices of bacon ($15). This was so good too. The ‘French toast’ was like a slice of cake and was moist and flavourful, the whip and the syrup were perfectly paired. I really enjoyed this restaurant and would like to go back one day to see what kind of offerings they have for other meals. Last weekend we were in Banff for my company Christmas party (I know awesome right?) and we decided to check out a couple places that had been featured on Burger Wars Banff. Both were decent burgers but there was one clear winner. Our first night we went to the Banff Ave Brewing Co.. They have 2 other locations, one in Jasper (the original) and one in Fort McMurray. When we arrived we were seated right away. The place was relatively busy but not overly so. Our waitress came over and let us know that they had 2 seasonal beers available which we both opted out of and went with something off the menu. I had a pint of the Banff Ave Blonde Ale ($7) and Ward had the Brewer’s Oar Cream Ale ($7). Both were good. Mine was light and refreshing and Ward’s had a nice creaminess and was a bit heavier but not too heavy. After our drinks arrived we ordered our food. I got the Brew Pub Drive-In Classic (featured on Burger Wars) which had 100% Alberta beef, lettuce, (hold the tomato), onion, pickle, Dijon, mayo ($14) and I added smoked cheddar (+$2) all on a garlic buttered brioche bun and it came with skinny fries. The burger had good flavour but the meat was a little on the dry side. The mayo and Dijon were a nice touch as was the toasted garlic butter bun. The fries were a bit over cooked but they came with a side of Sriracha mayo that helped them out a bit. Over all a decent burger and meal. Ward ordered the Buffalo Chicken Sandwich which had the choice of grilled or crispy chicken breast (he went with crispy) then topped with Frank’s red hot, smoked cheddar, bacon, lettuce, tomato, blue cheese dressing on a mini French loaf served with skinny fries and Sriracha mayo ($16). He said it was very spicy and the sandwich was huge! He didn’t finish the whole thing. I didn’t have a bite since it had tomatoes on it. The following day we decided to go to the Saltlik for lunch. They are tucked away off of Banff Ave but have a cute mountain cabin looking exterior. They also have a location in Calgary. Since it was mid afternoon the place wasn’t busy at all, just a few people having a late lunch or early drinks. The burger that was featured, and won, on Burger Wars was the Royale with Cheese. Ward went ahead and ordered it. This burger was Kobe beef topped with aged cheddar, bacon, lettuce, (hold the tomato), onion, pickle, garlic aioli on a brioche bun, served with skinny fries ($18.50). This burger was so good! So moist it was dripping on the plate, lots of flavour, and that garlic aioli was just right! The fries were also really good, well seasoned with salt and pepper and just the right crisp. Since Ward was ordering the Royale with Cheese I decided to go with something different and got the Wolly Bully Burger. This had a bison and pork patty, 2 panko crusted onion rings, emmental cheese, arugula, truffle aioli on a sourdough bun served with skinny fries ($18). The flavour of the burger was nice and it was a big burger but it was a little dry and the arugula didn’t stand up to the heat of the patty and became wilted. I was sad that I hadn’t ordered the Royale as well. So the clear winner here was the Royale with Cheese! Next time I’m in Banff I will make sure to go back and get my own so I’m not just stealing bites of Ward’s. I don’t do to much baking for Christmas and the holidays but I’ve developed a tradition of making this biscotti over the last couple years. 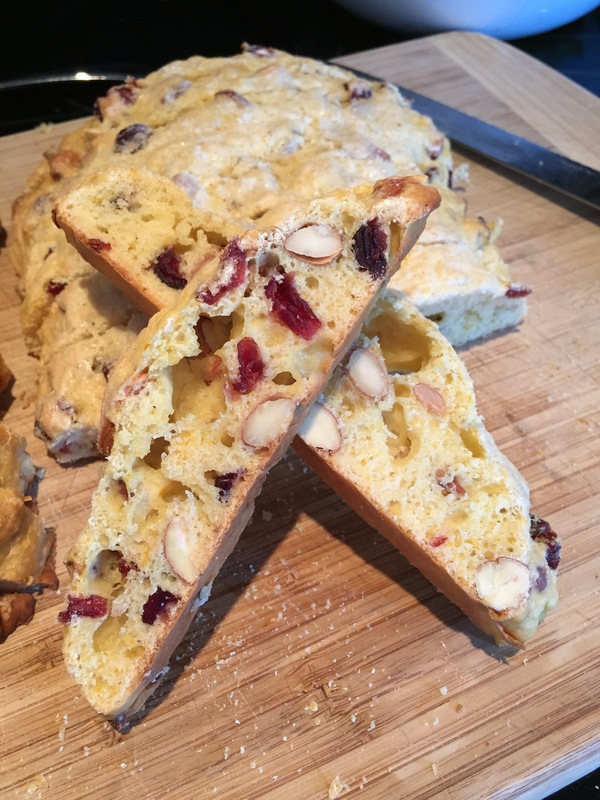 For the last 3 years I get together with my friend Gloria and we bake orange-cranberry biscotti. I’ll admit mine doesn’t actually make it to Christmas it gets gobbled up within a week of baking it but it’s a fun tradition and always good to get together and gab while we get our hands dirty. Traditional biscotti is twice baked, once as a log then cut and baked again to give you those super crunchy cookies. We like ours once baked, it leaves you with a chewy treat that is easy to enjoy. – Preheat oven to 350F and line a large baking sheet with parchment paper. 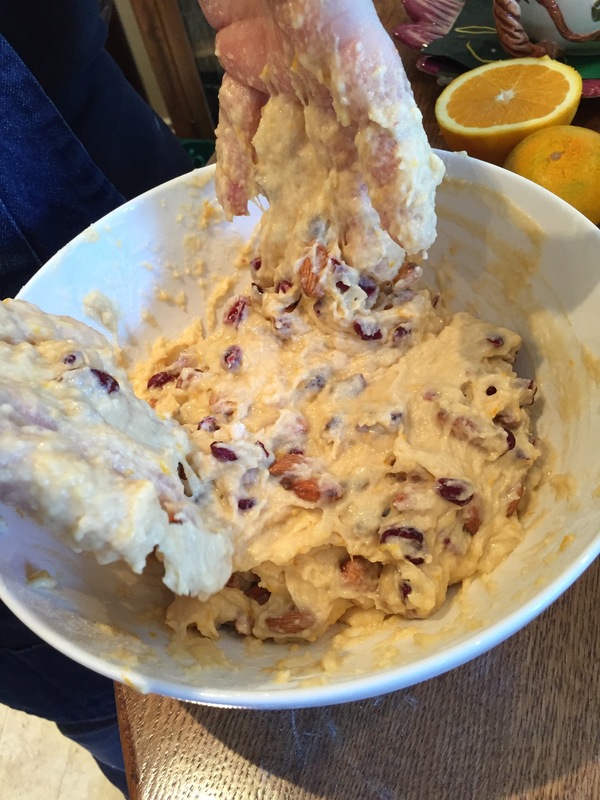 – In a large bowl mix together flour, baking powder, almonds and cranberries. – Zest orange into dry ingredients and mix well. – In a medium sized bowl crack eggs and whisk, add 1 C sugar and vanilla and mix well. – Juice orange and pour juice and pulp into wet ingredients and mix together (you should get about 1 cup of juice, if not top it up with some OJ if you have it on hand but if not a little water will do the trick). – Make a well in your dry ingredients and pour about 1/3 of the wet in and start mixing with your hands, add the next 1/3 and continue mixing, add the last 1/3 mix and you should have a very sticky dough. Be careful to only mix until wet and dry are just incorporated together, an over mixed dough will give you tougher cookies. 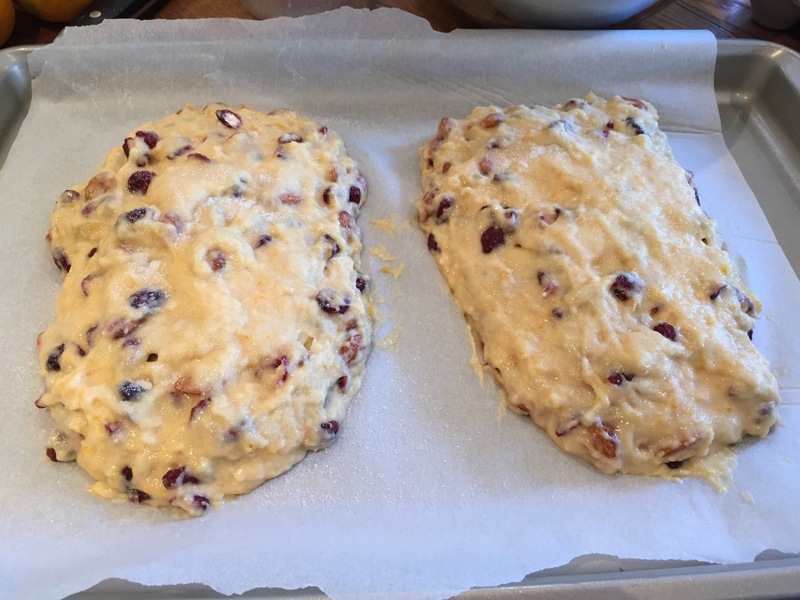 – Form dough into 2 oblong shapes on the lined baking sheet. – Bake in preheated oven for about 30 minutes until lightly golden brown and a toothpick inserted comes out clean. 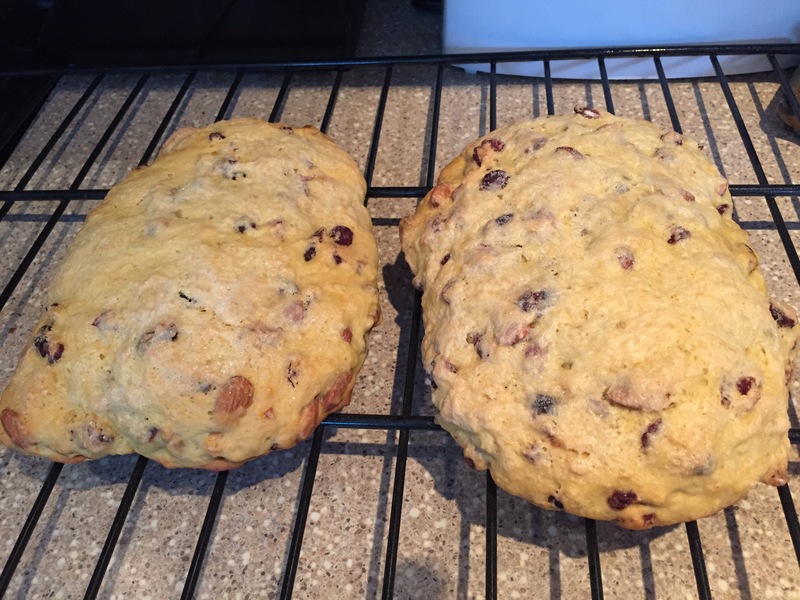 – Allow to cool on a wire rack and once cool cut into about 1 inch slices for each cookie. Koutouki on 124 street & 107 ave is one of my all time favourite restaurants in Edmonton! My mom and I first ‘discovered’ this cute little restaurant in the early 2000s and ever since then it is my first choice when I get to pick where we go for a special occasion. This restaurant has a bit of a story to it. The family that owns and operates it used to have 2 other locations, one on the west end that closed and one on the south side that they sold. Around 2005 they were featured on the food network for 2 seasons on a show called Family Restaurant which gave us all a behind the scenes look at all 3 restaurants at the time. Currently the family runs the 124 street restaurant and operates a food truck called Little Village Food Truck in the warmer seasons (which I will make a point of visiting when they open again in the spring). My hubby, Ward, and I went a couple weeks ago with 3 friends. I made a reservation and when we arrived we spotted one of our friends at a table so went over and sat down. About 10 minutes later we thought heck our other friends must be lost, so we text them to see where they were. Turns out they were at another table! Lol. We all found this quite amusing and the owners daughter was very apologetic for the mix up. We weren’t troubled by this at all and simply switched tables. We quickly let our server know that we would be having the Meze. With the Meze you will get about a dozen different dishes including dips, appetizers, salad, meats and vegetables all for $38/person. The menu states “but beware, don’t be tempted to finish every dish that arrives, or you may feel as if you have eaten for a week. Take your time and enjoy the meze “SIGA- SIGA”.” And boy is that the truth. 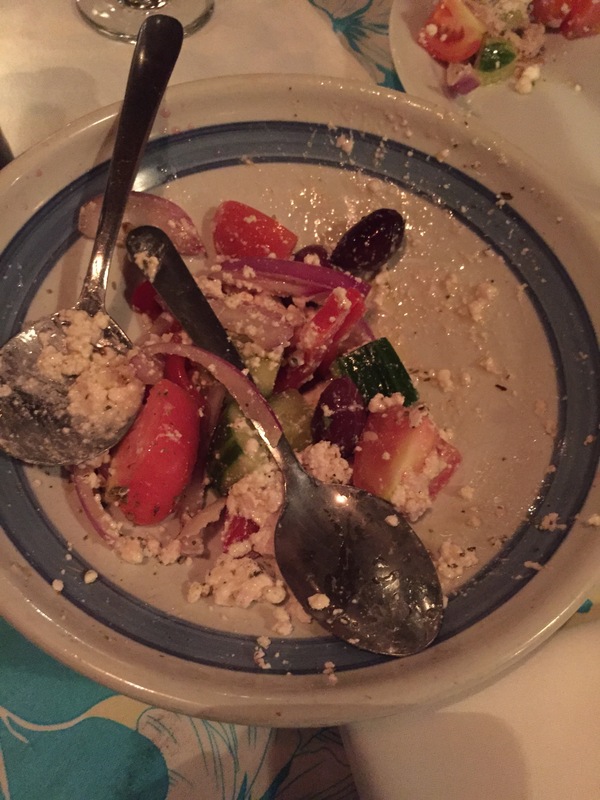 Our Meze started with a fresh Greek salad. No lettuce in this salad. 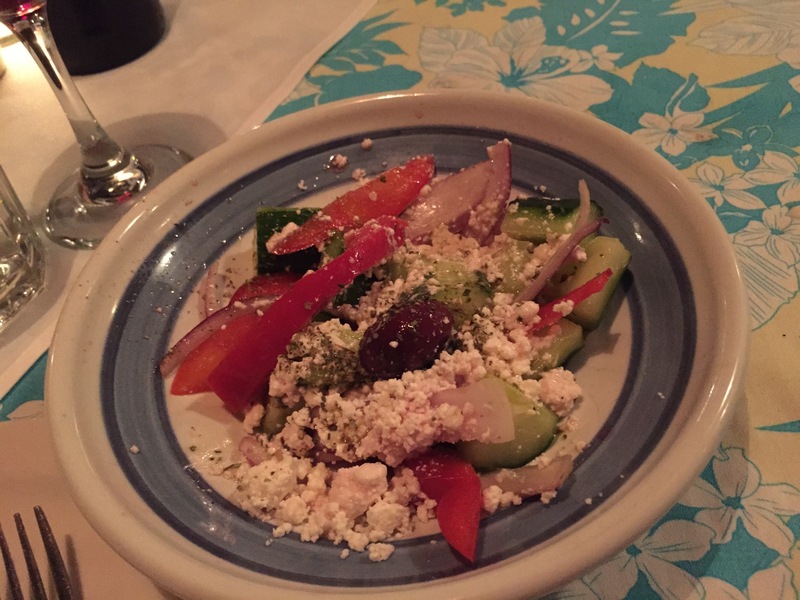 If you see a place put lettuce in a Greek salad put your fork down and run, don’t walk, as fast as you can away from there because they don’t know what traditional Greek is. 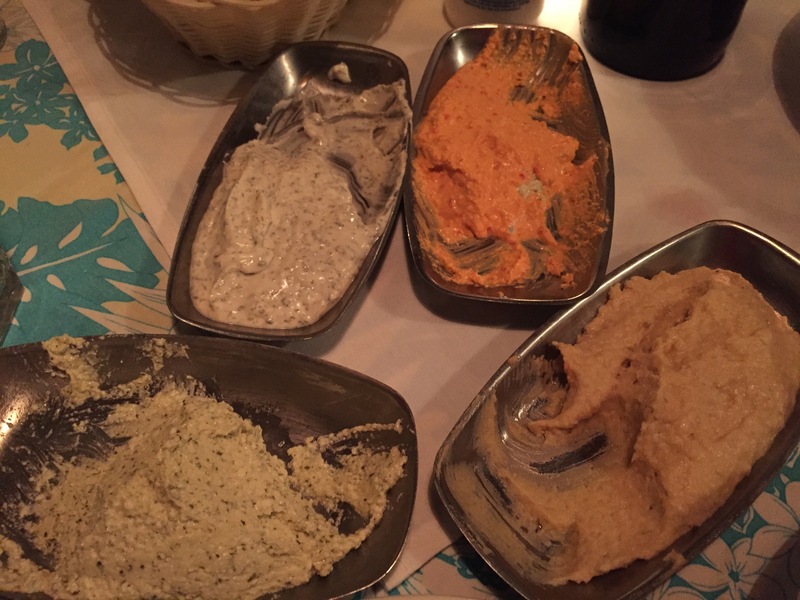 Within minutes we were brought 4 dips; tzatziki, homous, Kopanisti (Spicy feta dip with mint) and Tirosalata (Roasted red pepper & feta dip) served with fresh soft pita bread. Next we were served calamari. 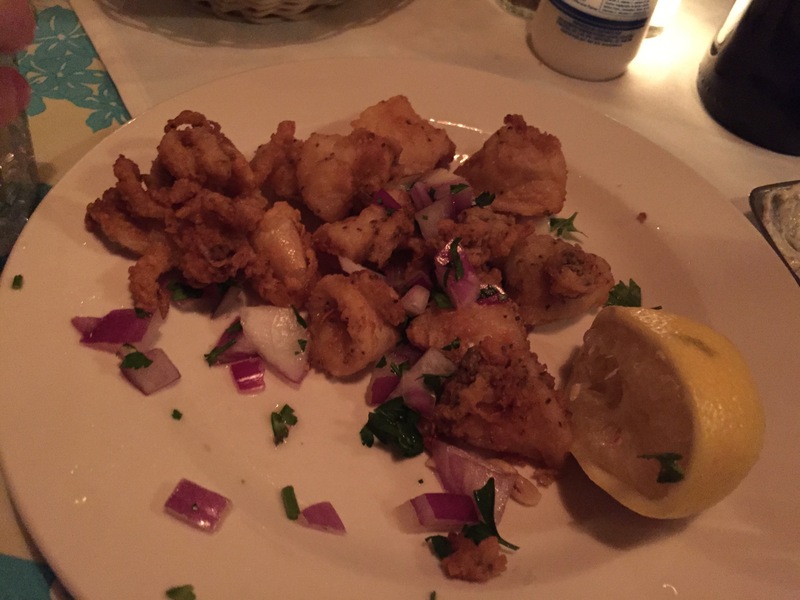 Koutouki’s calamari is the absolute best I have ever had! It is perfectly coated and cooked! It’s like butter in your mouth, soft and delicious. And with a squeeze of fresh lemon over it makes it absolutely perfect. If you have leftover tzatziki try dipping the little gems in there, it’s a pleasant combo. 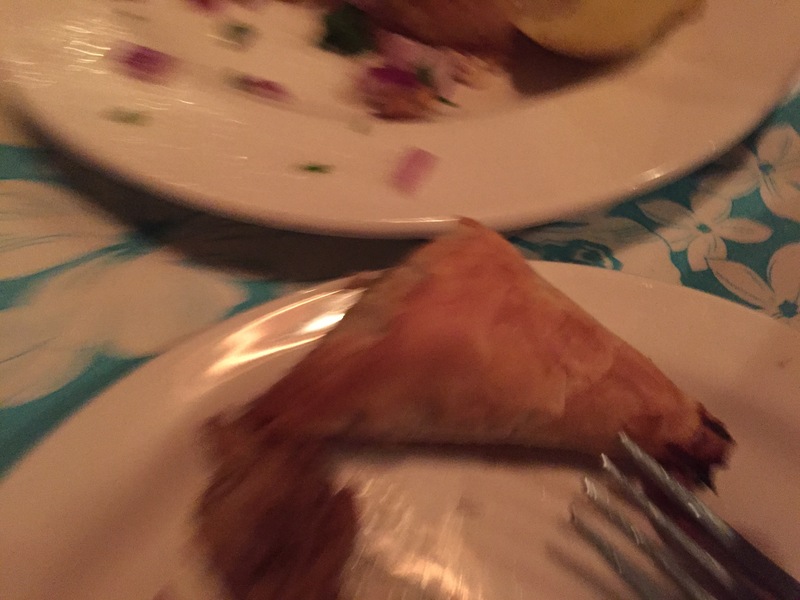 Then the spanakopita (spinach & feta wrapped in a phyllo pastry) very good and blows any of those frozen ones you can get at the store out of the water. 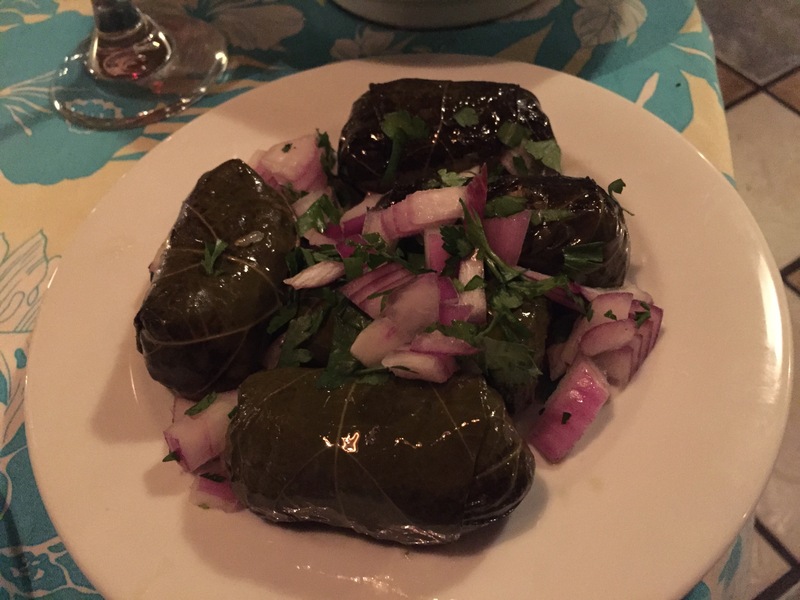 Then we were brought the dolmades (grapevine leaves stuffed with ground beef and rice) which are served warm. Also very tasty. It was at about this point that we asked our server to slow the service down so we could catch up on eating and chatting. There was no problem with that and it was a few more minuets before our next dish came out. It gave us some time to digest just a little before digging right back in. 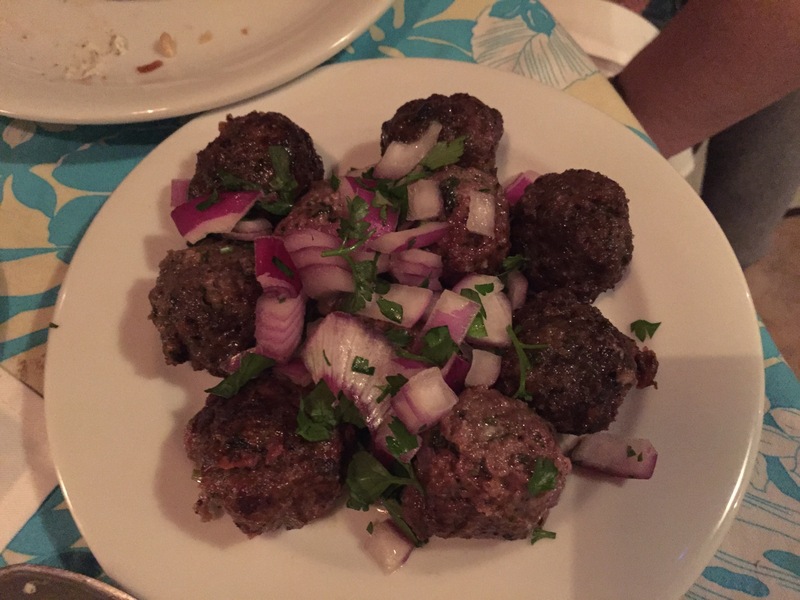 We started back up with the keftedes (Greek meatballs). This is my hubby’s favourite dish! When the west end restaurant (Koutouki Ouzeri) was still open he used to stop by and pick up an order of these for takeout and I’d be lucky if one made it home to me haha. These meaty little balls of heaven have a slight minty essence and are loaded with flavour. Also quite delicious with a little tzatziki dip. The next dish we got is not actually part of the Meze but we ordered it as an addition since we love it so much. 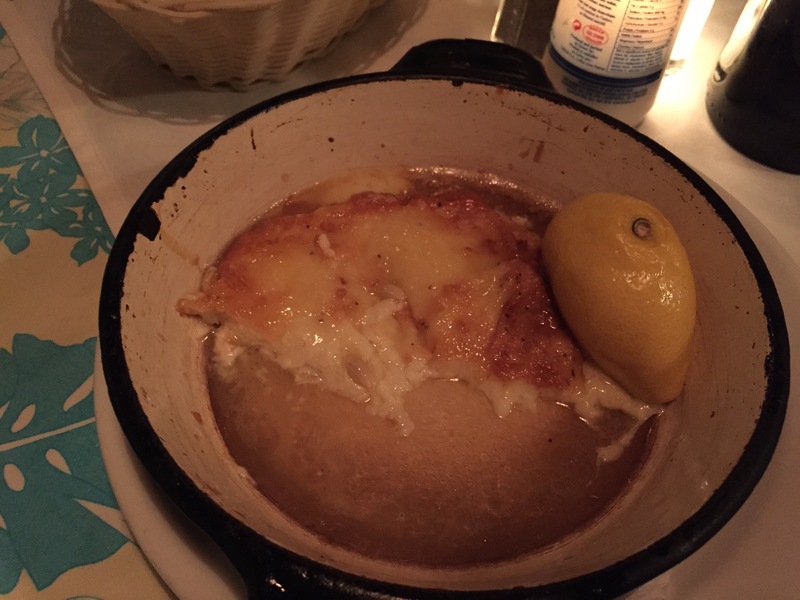 Saganaki (pan fried kefalotiri cheese) it’s served in the pan with half a lemon on it. Squeeze the lemon over it then dig in while it’s still hot and gooey! 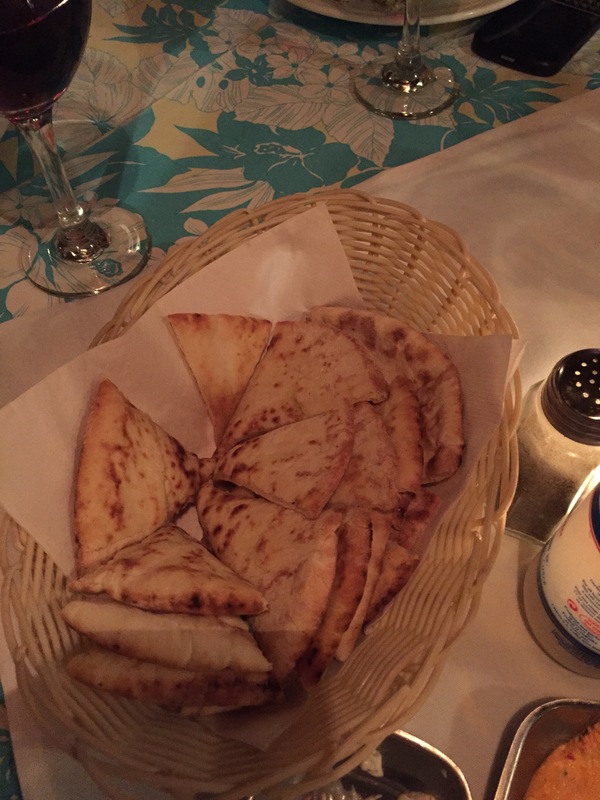 I like eating it all on its own but our friends enjoy eating it with some of the pita. 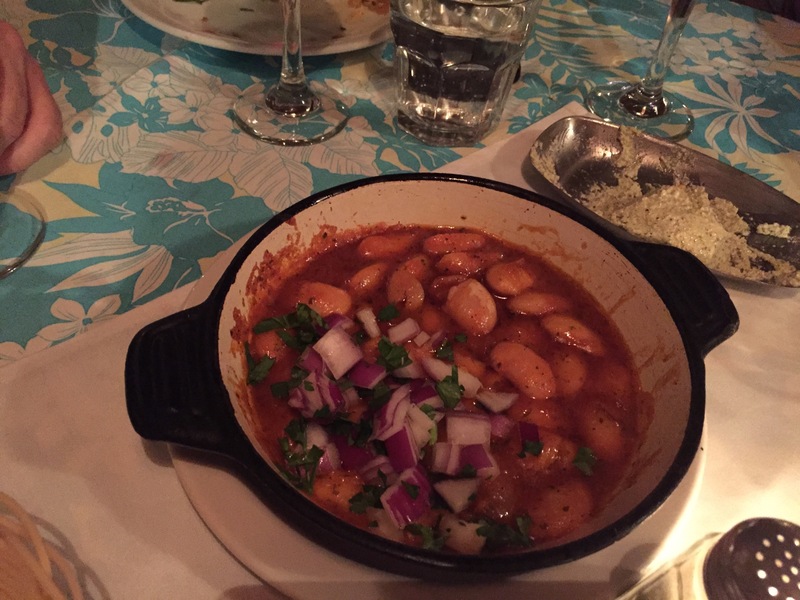 Our next course was Gigantes Plaki (giant beans baked in tomato sauce). They really are giant! The tomato sauce they are in is soft tasting and not too tangy. Two more dishes to go! 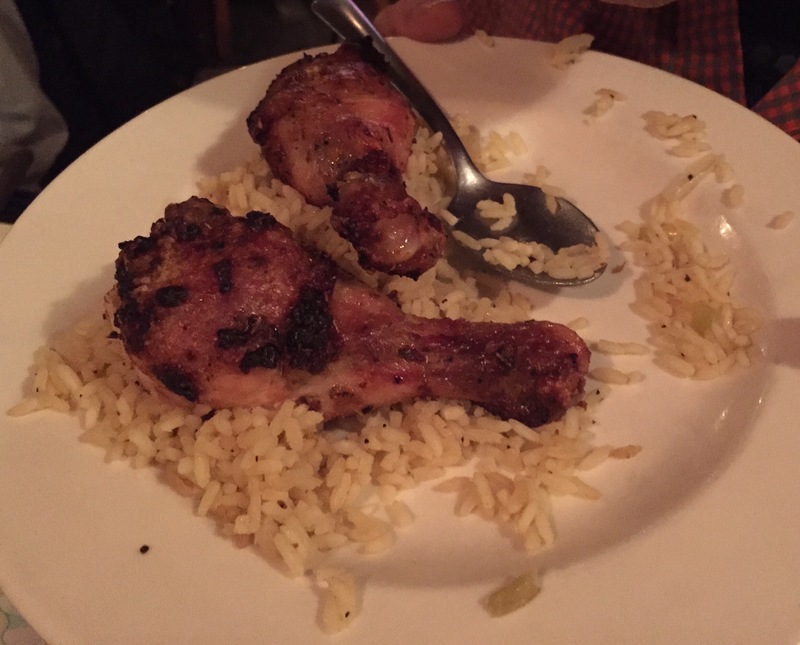 After a few minutes we were brought roasted chicken on a bed of rice pilaff. As far as I can tell this dish is exclusive to the Meze. The chicken was well seasoned and the skin was crispy while maintaining moist meat underneath. The rice pilaff is good though I would never go out of my way to order a pilaff so I don’t really have anything to compare it to. 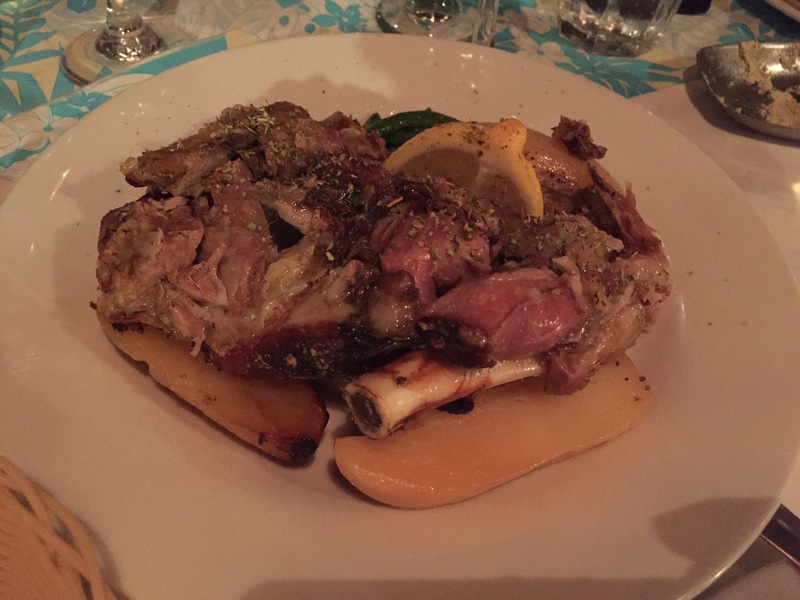 The final dish served with the Meze is Arni Kleftico (slow roasted lamb) and lemon roasted potatoes. The lamb is tender and nicely seasoned and the potatoes and well cooked and very lemony. This time I found the potatoes to be almost too lemony but usually they are spot on. By this time most of us had sore bellies from eating so much so we were all sitting back and rubbing them. 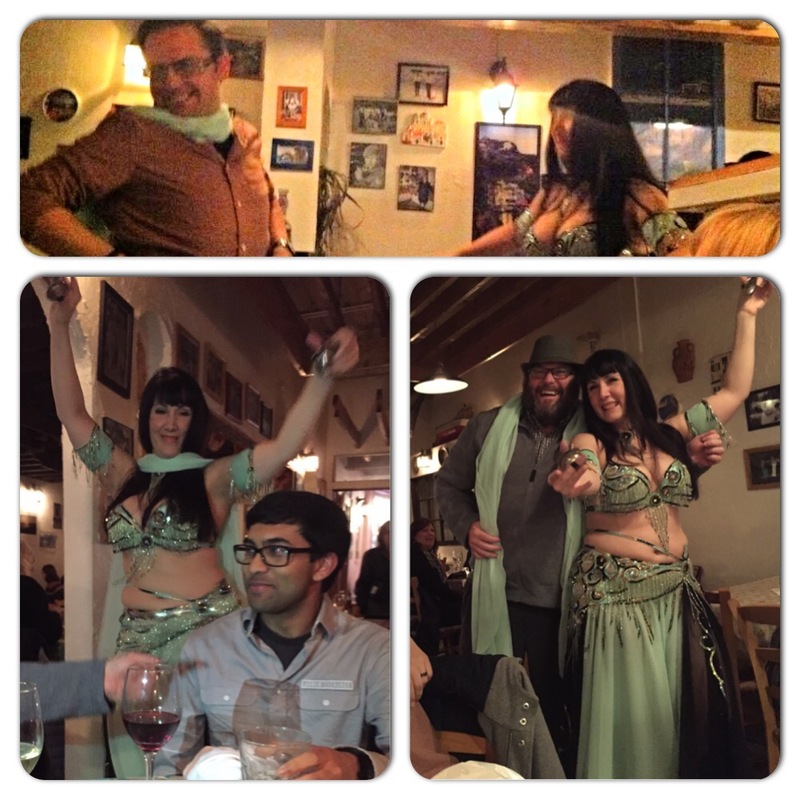 This is when the music got turned up, a belly dancer came out and a couple plates got smashed! After the little show our waitress came back and asked if anyone wanted coffee or dessert. I looked around the table to most people shaking their heads, all but one in fact. Our crazy friend Tyrone wanted to know what kinds of desserts they have. We honestly don’t know where he puts it! So a couple coffees with ouzo were ordered and a dessert then we continued to rub our bellies and let some of our food digest. It was a great night with good friends and so much good food. I can’t wait until my next visit to Koutouki!